Last night, I was very fortunate to have been invited to an exclusive dinner party hosted by our friends to celebrate a great milestone for his career. 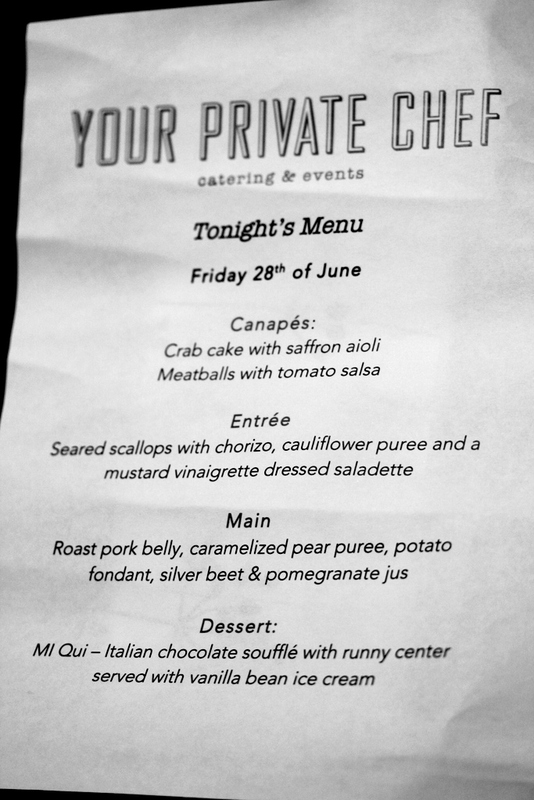 When I say exclusive, I am not kidding – it was a full on “Suit Up!” occasion and they hired a private chef to do all the cooking! They even hired a waitress to serve the food, and they take care of all the cleaning up afterwards. Our hosts didn’t have to lift a finger, and we had an epic evening of exquisite wining and dining. How was I not made aware of such service prior to this? Honestly, I thought private chefs were only available to hire in Bali, lol. I have to admit, a night like this was not cheap. But was it worth it? 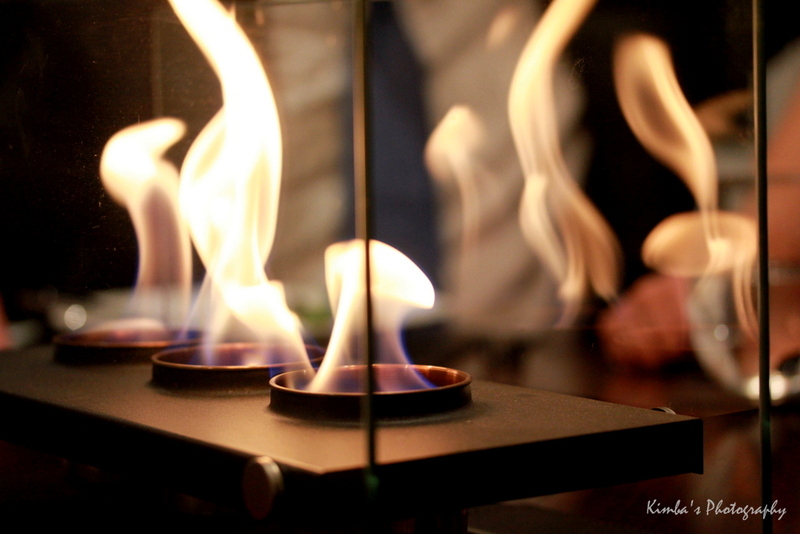 Read on to find out…..
We were presented with a very mouthwatering menu carefully selected by our hosts. You can tell based on this menu that our friends have great taste in food. While we were having pre-dinner drinks, we were served with some delicious canapes. 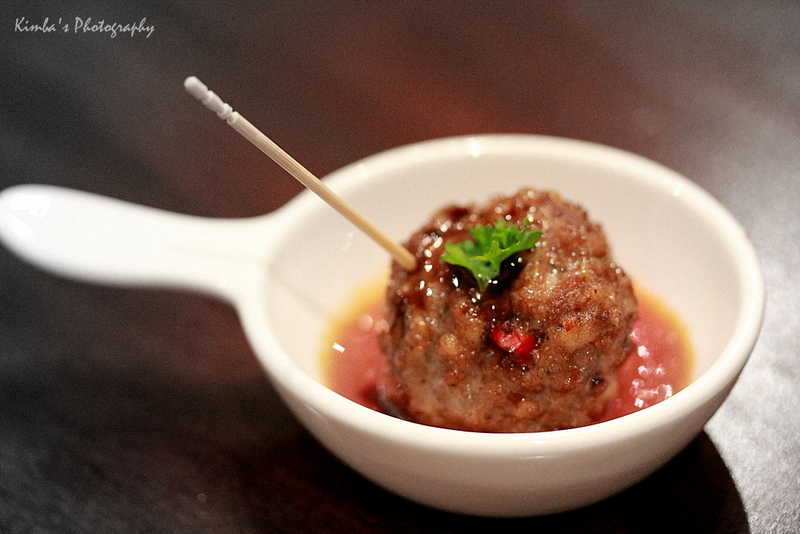 This meatball was full of flavour and was so deliciously juicy and tender. Gone in 3 seconds! It was like an explosion of meaty goodness in my mouth. So good! 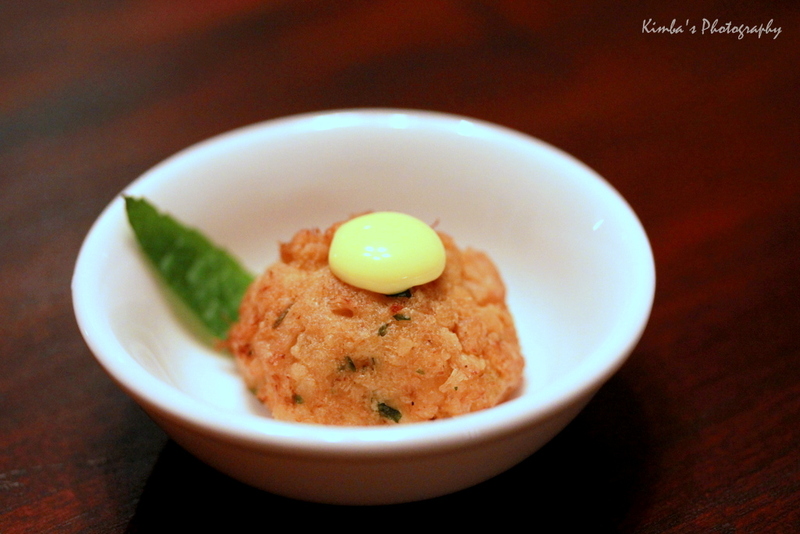 The crab cake was tasty and flavoursome, but I personally would’ve preferred a more crunchier texture on the outside. It definitely had the right smooth and fluffy texture overall, but it did not have an outer layer of crisp. Still absolutely delicious though! 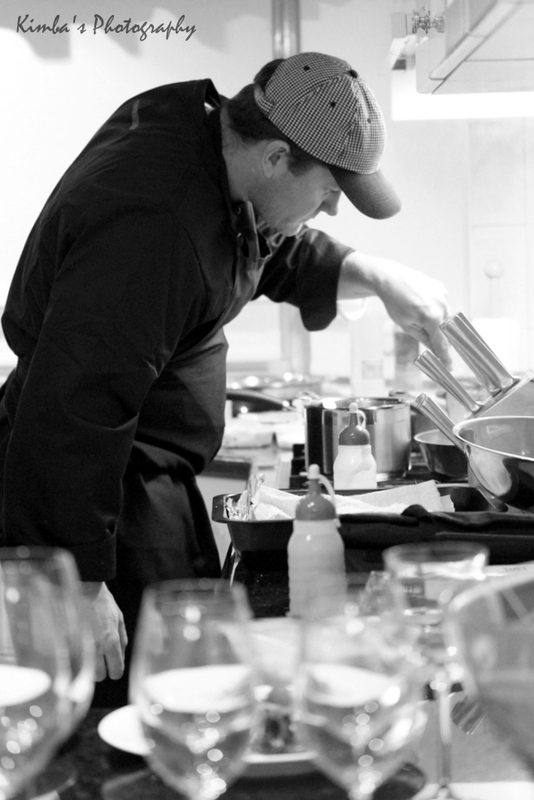 As we were seated for the start of our 3-course meal, our chef Darryn was busy cooking and plating up our entrees. The scallops were freshly pan seared for just the right amount of time and served while it’s still hot. 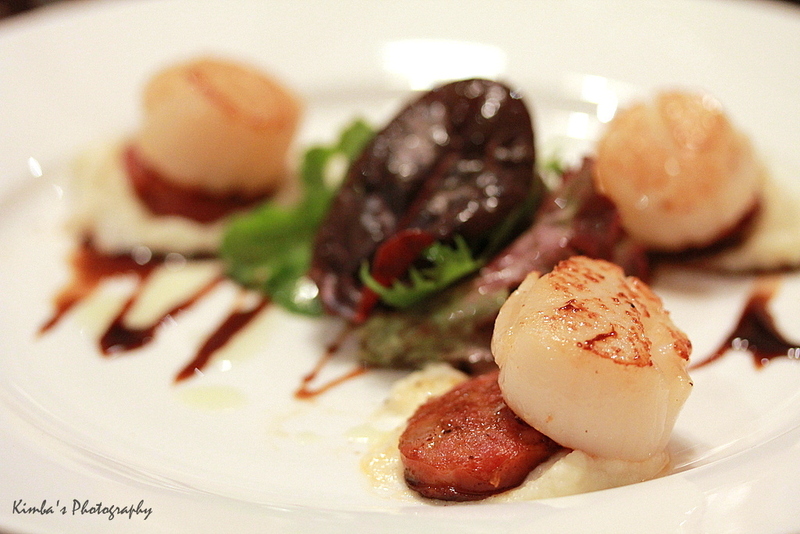 So our entrees were served, delicious scallops with chorizo and cauliflower puree – my kind of entree! It did not disappoint, the scallops were perfectly cooked and how can we not love chorizo? The cauliflower puree and vinaigrette complimented the flavours of both the scallops and chorizo so perfectly. I wanted more!!! But we had to save room in our bellies for our mains…. 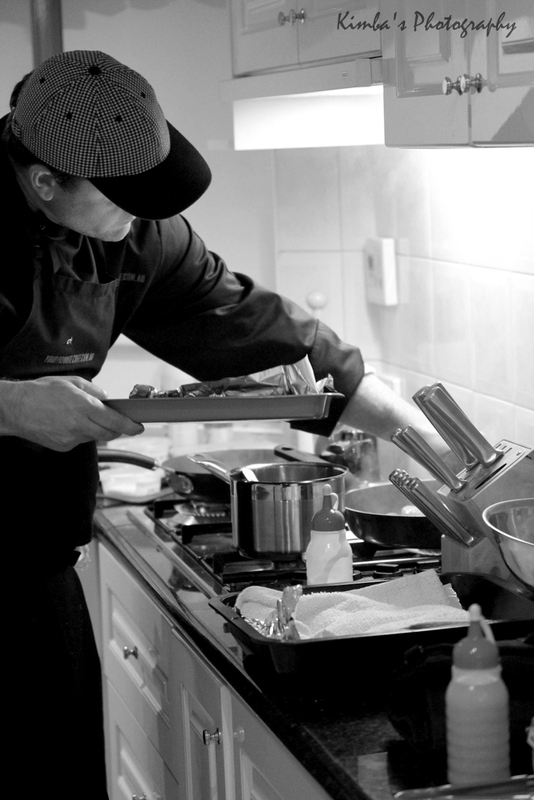 And so while we were busy enjoying our entrees, the chef was still working hard in the kitchen getting the mains ready. I loved just watching him work, and really amazed at how he just fits in and make every one of his customers’ kitchens work for him. It really takes a unique skill to still be able to cook well in various different kitchens all the time. 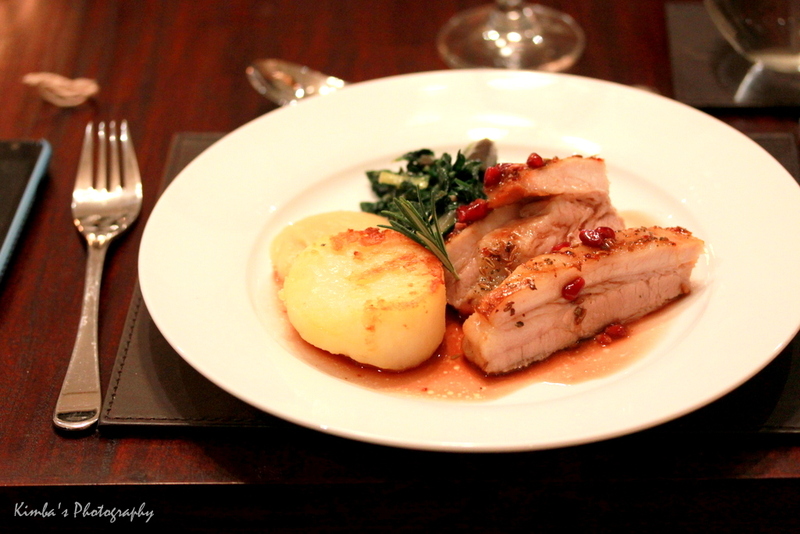 Then the mains were served… and I am salivating just at the thought of that juicy and tender pork belly. Mm mmm!! The pork was soooooooooo good especially with that delicious pear puree. The potatoes were a little bit underdone, I would’ve liked it just slightly softer and fluffier on the inside but it had a really good crusty outer layer which was great. The pomegranate really held the whole dish together by adding a bit of acid flavour to the whole thing. It was just perfect. So wholesome, delicious, great for a cold winter’s night. Our dinner definitely ended on a high. 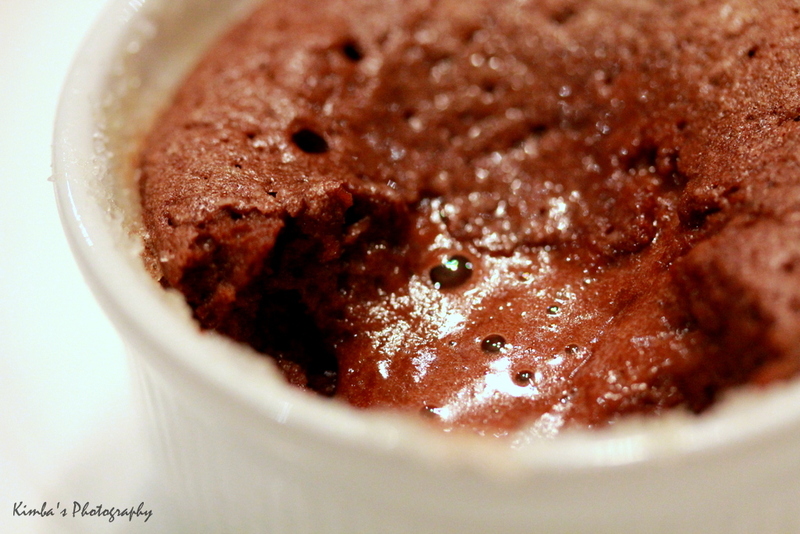 Chef Darryn’s chocolate souffle was absolutely flawless. 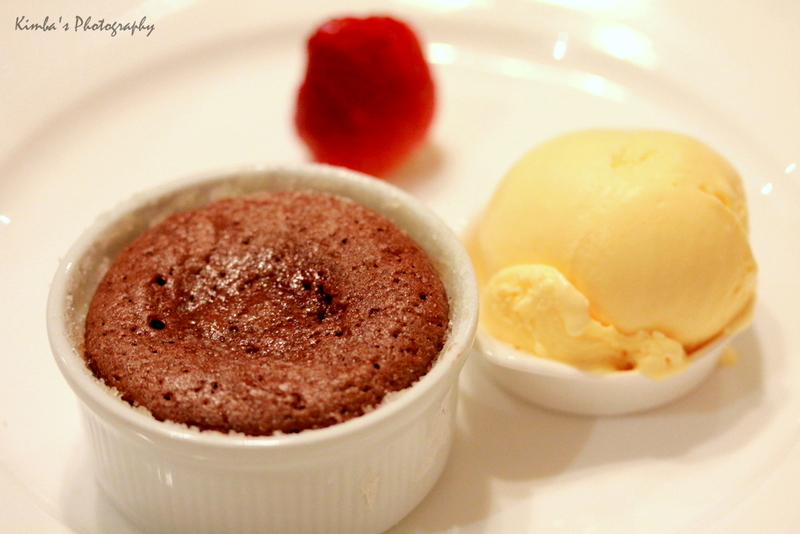 It had the delicious runny centre and amazing crusty top layer with a little bit of sugar, the ice cream was sooooo smooth and yummy, I really cannot fault this dessert! I pretty much licked my ramekin, well the sides of it anyway, felt wrong to keep licking haha. So, the verdict. Was it worth the money our very generous friends spent just for one night of exquisite dining? Well, let’s put it this way… our friends could focus on just being hosts and having a great time without worrying about preparing, cooking and serving up the food. By the time we finished our meals and had more drinks, the kitchen was absolutely spotless. It was as if cooking in that kitchen never happened! We get restaurant quality food. It was quite an epic evening. So, even though I personally may not currently have the means to host such an epic evening myself, I actually think it was totally worth it. They wanted an epic night at home, they got an epic night at home. We were all truly jolly and had such a great night. It was definitely a night to remember. My photos are proof of that! 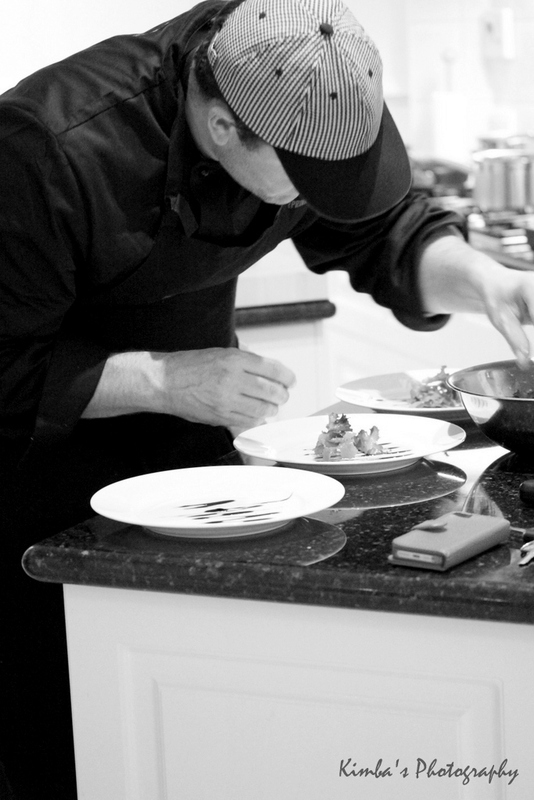 If you are interested to look into hiring a private chef yourself, check out www.yourprivatechef.com.au – they do everything from gourmet weekly meals delivered fresh to your door, exclusive dinner parties from 2 to 2,000 people, corporate catering and cocktail functions. 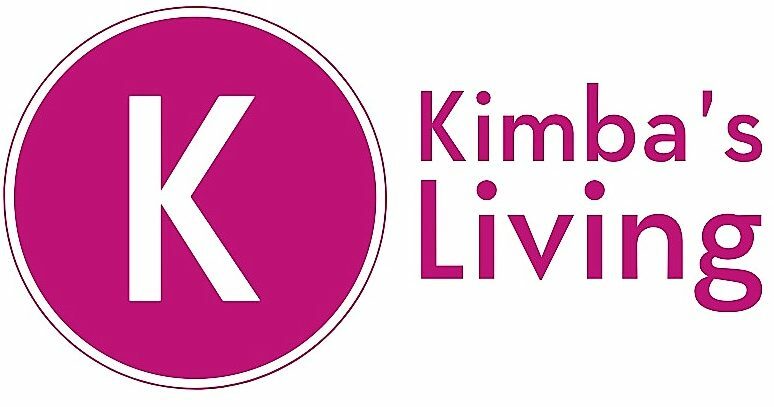 They do the menu planning, shopping, preparing, serving and even cleaning up! It was definitely a fuss-free evening for the hosts and someday, with the right occasion, I might host one of these fancy dinner parties with a private chef myself! Hehe. Big congrats to your friend! I can't think of a better way to celebrate a career milestone than with close friends over an incredible meal. And omg private chef seems so OTT but I TOTALLY want to have that one day too! First, need to hit that career milestone. Second, need to be living in a more refined condition than my current abode.